Europe’s ExoMars 2016 mission has finally arrived at the Red Planet on October 19, completing a lengthy interplanetary trip. The Trace Gas Orbiter (TGO) has been inserted into Martian orbit and the Schiaparelli module descended to the planet’s surface. However, the fate of the lander is currently unknown as ESA still awaits for the confirmation of the touchdown. The joint ESA-Roscosmos ExoMars (Exobiology on Mars) mission was launched by a Proton-M rocket from the Baikonur Cosmodrome in Kazakhstan on March 14, 2016. 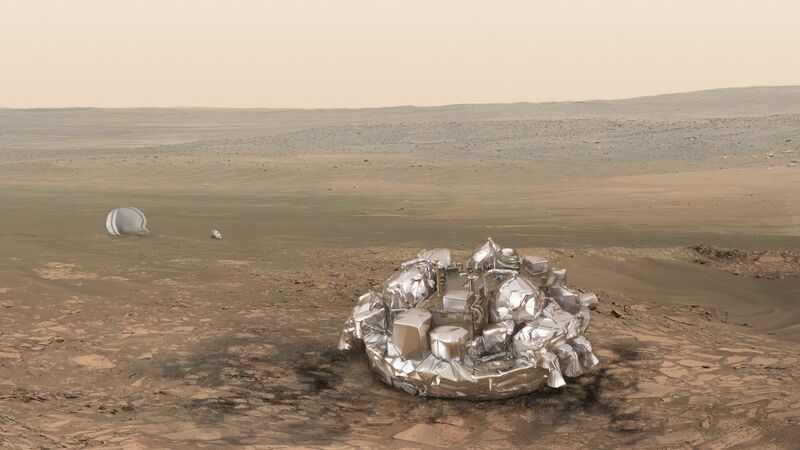 The mission, tasked with searching for biosignatures of life on Mars, consists of two spacecraft: the TGO, and the Entry, Descent and Landing Demonstrator Module (EDM) called “Schiaparelli”. Nearly 11 hours after liftoff, the stack comprising TGO and Schiaparelli was sent on a journey to Mars with an initial velocity of some 20,500 mph (33,000 km/h). Shortly after, when the ExoMars spacecraft reached a stable orientation, it deployed its X-band high gain antenna and two power-generating solar arrays. The first signals from the spacecraft were received about 12 hours after launch by the Italian Space Agency’s (ASI) Malindi ground station in Kenya and then relayed to the European Space Operations Centre (ESOC), ESA’s mission control in Darmstadt, Germany. It took the spacecraft three days to perform its initial set of checkouts and reconfigurations. After that, the mission entered its commissioning phase lasting until April 24, during which the controllers carried out detailed checks of the orbiter and the lander. They also conducted a trajectory correction maneuver on March 21 to remove launch vehicle insertion errors and set up the proper trajectory for the deep space cruise phase of the flight. After completing about 60 percent of its journey, the ExoMars spacecraft was ready for its most crucial maneuver of the cruise phase – the firing of its powerful 424 N bipropellant main engine. This operation was performed on July 28 when the engine was fired for 52 minutes. 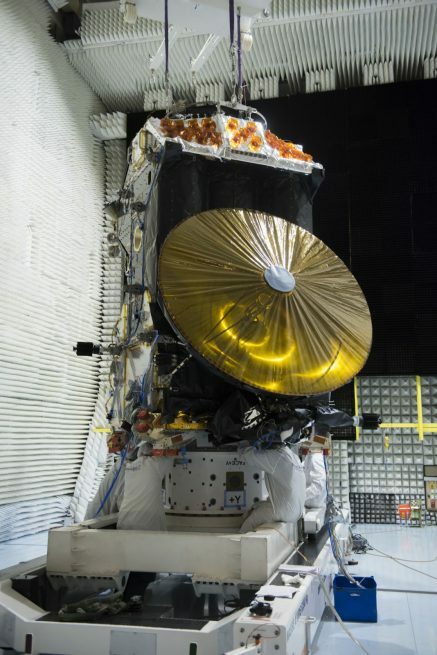 “The engine provides about the same force as that needed to lift a 45-kilogram (100-pound) weight in a fitness studio, and it ran for about 52 minutes, so that’s quite a significant push,” Silvia Sangiorgi, deputy spacecraft operations manager at ESA, said in July. This critical maneuver was carried out with the assistance of an ultra-precise navigation technique that allows pinpointing the spacecraft’s position to within 0.6 miles (1 kilometer) at a distance of 93 million miles (150 million kilometers) from Earth. With the biggest burn completed, the busy period for mission controllers started as their work became more intense. Since the beginning of August, ESA’s deep-space tracking stations at Malargüe, Argentina, and New Norcia, Australia, began to provide daily telecommand passes. Contact with the mission was further intensified about 10 days ahead of arrival at Mars, allowing the team to receive data 24 hours a day. This enabled engineers to carefully monitor the spacecraft and plan its complex orbit-entry activities. From August to October, the spacecraft has completed three trajectory correction maneuvers: on Aug. 11, in mid-September, and on Oct. 14. The last correction was achieved by firing TGO’s thrusters for a minute to get a change in speed and direction of just 1.4 centimeters per second (0.55 inch per second). Although a very tiny overperformance from the thrusters was reported by ESA, the burn was overall very good and lined up the spacecraft perfectly on the right orbit to deliver Schiaparelli onto the desired area. On Oct. 16, at 10:42 a.m. EDT (14:42 GMT), the Schiaparelli module had been successfully separated from the TGO. However, during the release of the lander, a small glitch was encountered, as the orbiter did not return telemetry, sending only its carrier signal that indicated it is operational. 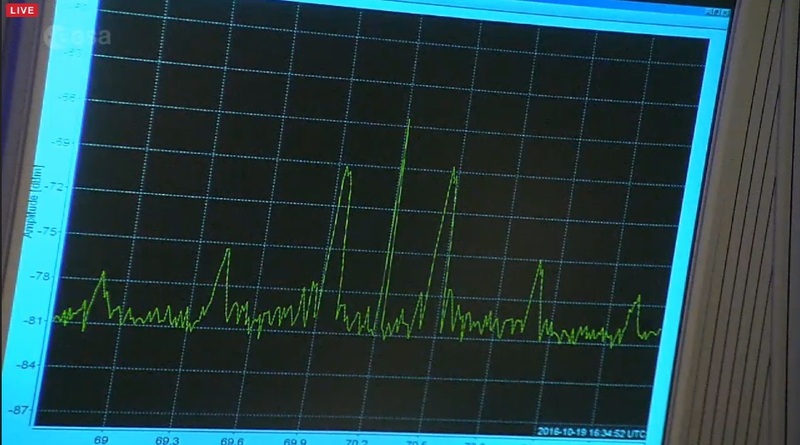 Fortunately, the full telemetry link with the mission had been restored about two hours later, via the Malargüe station. About 12 hours after the separation, at 10:42 p.m. EDT (02:42 GMT on Oct. 17), an orbit raising maneuver of the TGO was conducted. The firing lasted one minute and 46 seconds, which raised the probe’s orbit by several hundred miles above the Martian surface to avoid collision with the planet. With both spacecraft separated and the TGO put into a higher orbit, the mission was all set for Oct. 19 – the most important day of the ExoMars’ journey to the Red Planet. This is the day of the TGO’s Mars Orbit Insertion (MOI) and Schiaparelli’s landing in Meridiani Planum – a plain containing an ancient layer of hematite, an iron oxide, that almost always forms in an environment containing liquid water. The last day before arrival at Mars was quiet for both spacecraft. Schiaparelli had been ‘asleep’ and continued its coast toward the designated landing site. All commands for its entry, descent, and landing, and also science mission were previously uploaded by the engineers. Meanwhile, the final command sequence was uploaded to the TGO. It managed the spacecraft autonomously during its critical orbit entry maneuver. With the Giant Metrewave Radio Telescope (GMRT) in India, a fleet of NASA and ESA spacecraft orbiting Mars, and final commands uploaded, the teams were ready to listen for the first signals of Schiaparelli’s landing. As for the TGO, the controllers successfully ignited the orbiter at 9:05 a.m. EDT (13:05 GMT) on Oct. 19, burning its engine for about two hours and 19 minutes in order to slow it down and inject it into the Martian orbit. The landing was expected to take place at 10:48 a.m. EDT (14:48 GMT); however, although initial signals provided by GMRT confirmed that Schiaparelli descended to the surface of Mars, so far no signal has indicated the touchdown. Moreover, no confirmation of the landing came from ESA’s Mars Express spacecraft and NASA’s Mars Reconnaissance Orbiter (MRO) that are currently orbiting the planet. 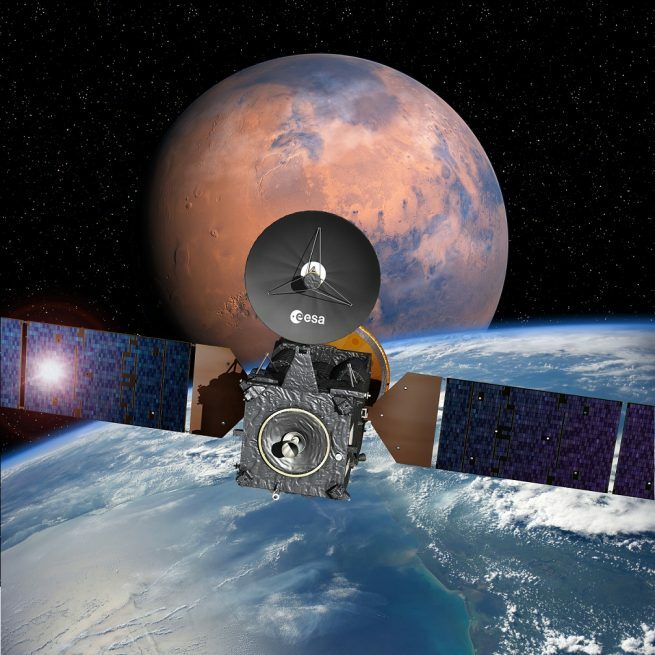 “TGO’s Mars orbit Insertion burn lasted from 13:05 to 15:24 GMT on Oct. 19, reducing the spacecraft’s speed and direction by more than 1.5 km/s (3,350 mph). The TGO is now on its planned orbit around Mars. European Space Agency teams at the European Space Operations Centre (ESOC) in Darmstadt, Germany, continue to monitor the good health of their second orbiter around Mars, which joins the 13-year-old Mars Express,” ESA said. The orbiter’s dimensions are 11.5 ft × 6.5 ft × 6.5 ft (3.5 m × 2 m × 2 m) with solar wings spanning 57.4 feet (17.5 meters) and providing up to 2,000 W of power. It has a mass of approximately 4.3 metric tons. ACS will help scientists to investigate the chemistry and structure of the Martian atmosphere. It will complement NOMAD by extending the coverage to infrared wavelengths and by taking images of the Sun to provide better analysis of solar occultation data. CaSSIS is a high-resolution camera capable of obtaining color and stereo images over a wide swathe. It will provide a geological and dynamical context for sources or sinks of trace gases detected by NOMAD and ACS. The Schiaparelli lander, built by Thales Alenia Space, is about 5.4 feet (1.65 meters) in diameter and 5.9 feet (1.8 meters) high and has a mass of 1,322 lbs (600 kg). It is designed to be capable of landing on a terrain with rocks as high as 1.3 feet (0.4 meters) and slopes as steep as 12.5 degrees. It is expected to be operational for up to eight Martian days after landing. Schiaparelli carries the Combined Aerothermal and Radiometer Sensors Instrument Package, called COMARS+, which is installed on the back cover of Schiaparelli, will gather the data to study this. COMARS+ consists of three small (22 mm diameter) combined sensors (COMARS) spaced equally across the rear cover of Schiaparelli, one broadband radiometer, and an electronic box. The lander is also equipped with INRRI – a Cube Corner laser Retroreflector (CCR) located on the zenith-facing surface of Schiaparelli. It will enable Schiaparelli to be located from Mars orbiters by laser ranging, both during Schiaparelli’s mission lifetime and, as it is passive and maintenance free, afterward. ExoMars project began to materialize in July–August 2009 when ESA signed contracts with NASA and Roscosmos to develop the mission. However, due to budgetary cuts in 2012, NASA terminated its participation in the project. One year later, Roscosmos became the main partner for ESA when the agencies signed a deal obligating the Russian side to deliver launch services, scientific instruments for the TGO and landing systems, together with rover instruments, for the second mission initially scheduled for 2018. Landing on Mars seems to be a challenge. Only NASA has it nailed down, assuming they don’t make contact with the lander. Yes it7seems to be a graveyard for other nations.